Each week, Bob Gaughan wraps up the college football weekend. Tody, with the end of the regular season, he focuses on the upcoming conference championship games. UB’s historic season continued with a victory in Bowling Green. The victory meant the Bulls will win the MAC east championship and play Northern Illinois in the MAC title game next Friday. The Bulls won with a dominating effort on both sides of the ball. Offensively they just bullied the Bowling Green battered defensive line. The Bulls ran for 332 yards. Jaret Patterson had 88 yards rushing and two TD’s in the first half. Defensively the big play came in the second quarter when Khalil Hodge stripped a fumble and Brandon Williams scooped it up and ran 69 yards for the score. That put the Bulls up 19-7 and they cruised from there out. Kevin Marks scored twice as well as every Bulls running back got into the game and ran well behind the dominant offensive line. Bowling Green could only muster 6 first downs the entire game. Total yards in the game was 483-205 for UB. Northern Illinois comes into the game having dropped their last two MAC games. DE Sutton Smith is their best player. He leads the MAC with 13 sacks and tackles for loss. In a battle for a birth in the Big 12 title game it was a scoring classic. Neither team seemed to be able to stop the other. Ironically the turning point was a big defensive play by Oklahoma in the fourth quarter. Curtis Bolton’s 48 yard fumble recovery in a strip sack of Will Grier gave the Sooners a two score lead 59-49. Grier was fantastic throwing for 539 yards and four touchdowns. For Oklahoma Kyler Murray and Marquise Brown are so fast it looks like it’s a video game you’re watching. Murray combined for 478 yards and Brown had 243 yards receiving. Oklahoma will play Texas in the Big 12 Title game. Jim Harbaugh should be fired for this performance. Ohio State was vulnerable coming into this game. Michigan had the better team. Harbaugh has never beaten Urban Meyer and after this performance one wonders if her ever will. Ohio State rolled up 567 yards of offense against his vaunted defense. Dwayne Haskins was wonderful throwing for 318 yards and five touchdowns. The only thing more disgusting than Michigan’s performance was Gus Johnson fawning over Urban Meyer and his story of redemption. I love Gus but Meyer deserved his suspension for covering up the abuse of his assistant coach Zach Smith. He’s lucky he still has a job. Ohio State now fights with Georgia and Oklahoma for the right to be in the college football playoff. 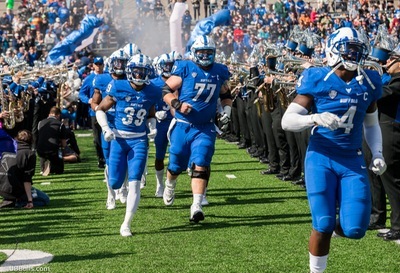 It took one year for the UB-Western Michigan game to get surpassed in the record books. UB played a seven OT game last year with Western Michigan where 139 points were scored 71-68. The Tigers and Aggies combined for 146 points for the highest scoring FBS game on record. LSU didn’t get any breaks at the end of regulation. An interception was over-turned when replay showed Kellen Mond’s knee was down after taking a bad snap for the center. A second was put back on the clock after Mond tried to clock the ball. It appeared time had run out. Mond finally hit Kendrick Rogers in the back of the end zone in the 7th OT for a two-point conversion to seal the win. For those that stayed up well after midnight this was a game for the ages. *Texas wrapped up their spot in the Big 12 title game with a close 24-17 win over Kansas. *UCF continued their winning streak 24 games but lost star QB McKenzie Milton to a gruesome knee injury. UCF downed USF 38-10. *In the snow in Pullman, Washington wins the Apple Cup for the sixth straight year 28-15 over Washington State. The Huskies will play Utah in the Pac 12 title game. *Florida halts a five game losing skid to Florida State with a dominating 41-14 win. FSU will not go to a bowl for the first time in 36 years. *Ugly brawl at the end of NC State’s 34 to 28 OT win over North Carolina. *Tua Tagovailoa wraps up the Heisman with a 5 TD performance in the Iron Bowl as the Tide rip Auburn 52-21. *Notre Dame clinches a playoff berth with an unimpressive performance in a 24-17 win over USC. *Minnesota wins the Paul Bunyan Axe for the first time in 14 years with a rout over Wisconsin 37-15. *Arizona State rallies from 19 down at the start of the fourth quarter to knock of rival Arizona 41-40. *Clemson’s defense looks vulnerable in a 56-35 win over South Carolina. The usually stout Tigers defense gave up 600 yards of offense to the undermanned Gamecocks.